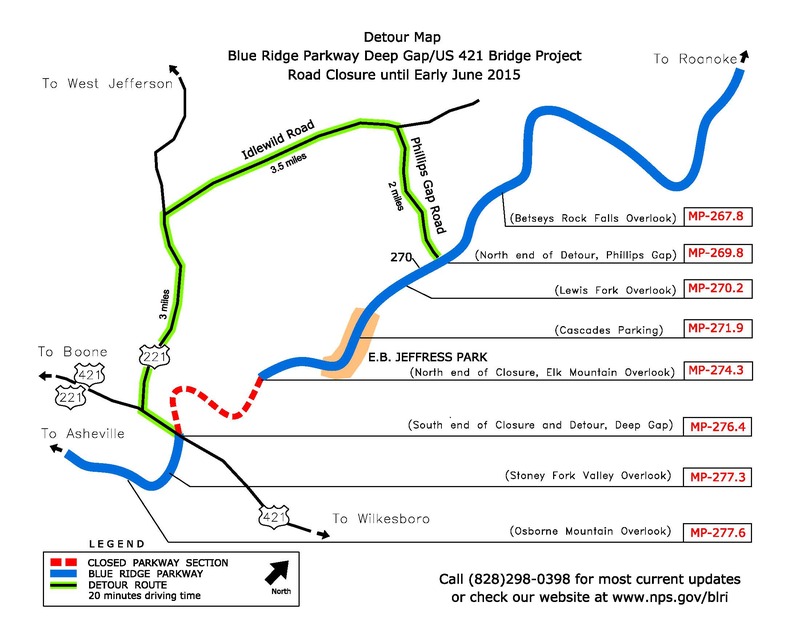 A section of the Blue Ridge Parkway will close on April 1, 2015, in order to make critical repairs to Deep Gap Bridge at US 421. A detour will be signed in the area from Milepost 269.8, at Phillips Gap north of the bridge to Milepost 276.4 at the US 421 ramp. Access to Jeffress Park Picnic Area will remain open from the north end of the detour. Critical repairs are being made to the concrete bridge deck. It is anticipated that the closure will be in place until early-June 2015. Due to the nature of this project, complete closure of the Parkway in this section is necessary for motorists, pedestrians, and bicyclists. Parkway managers ask for the public’s cooperation with this closure, asking motorists to stay alert, be aware of barrier signs, and follow the signed detour to insure optimal visitor safety. Parkway management regrets any inconvenience this project may have on local businesses or to our visitors. For more complete and up-to-date information about Parkway road closures, please visit the Parkway’s Real-Time Road Map at maps.nps.gov/blri/road-closures/.